flat roofs are ventilated or not depending on the structure of the roof. SBS or APP modified bitumen rolled roof is one of the types of flat roofs. SBS or APP modified bitumen rolled roofs are single-, double- or triple-layered depending on the roof structure. SBS or APP modified bitumen rolled roofing is usually delivered in rolls with the width of 1 metre; the length of bitumen rolled roofing in a roll depends on the weight of its square metre and one roll weighs up to 50 kg. The most common m2 weights of SBS or APP modified bitumen rolled roofing range from 2.5 to 5.5 kg. SBS or APP modified bitumen rolled roofing is usually welded to the roof with the help of gas burners and fixed to the underlying structure of the roof with dowels; less frequently, nailing, gluing or ballasts are used to fix bitumen rolled roofing. Plastic rolled roofing is one of the types of flat roofs. Plastic rolled roofing is single-layered with the layer thickness of 1.2, 1.6 or 1.8 mm. Plastic rolled roofing is delivered in rolls either 1 or 2 metres wide and there is usually 20 metres of roofing in a roll. Plastic rolled roofing is manufactured in different colours. Plastic rolled roofing does not require separate ventilation systems. Plastic rolled roofing is mechanically attached to the load-bearing structure of the roof with dowels and the joints are tightly welded together with electric heat blowers. Inverted roof is a subtype of a flat roof. Inverted roofs have a waterproof layer between the surface structure (e.g., insulation) and the load-bearing structure. Most common buildings with inverted roofs are terraces, bridges, tunnels, water reservoirs, multilevel car parks, walkable roofs and roofs with traffic. We use SBS modified bitumen rolls to construct the waterproof level and various foam insulation boards for insulation. Walkable roof is a subtype of flat and inverted roofs. In case of walkable roofs, the waterproof layer is between the surface structure (e.g. paving boards, bedding layer, filtering fabric, drainage mat) and the load-bearing structure. The waterproof layer is usually constructed of SBS modified bitumen rolled roofing and the roofs are insulated with various foam insulation boards, if necessary. Roofs with traffic are a subtype of flat and inverted roofs. 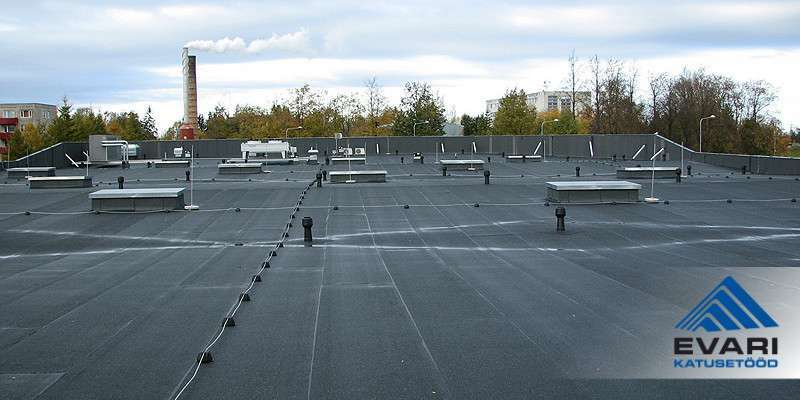 In case of a roof with traffic, the waterproof layer is between the surface structure (e.g., concrete or asphalt paving, bedding layer, filtering fabric, drainage mat, filtering fabric, insulation) and the load-bearing structure. The waterproof layer is usually made of SBS modified bitumen rolled roofing and, if necessary, the roofs are insulated with various foam insulation boards. does normally not require mowing. NB! Growing of the vegetation takes time and the roof requires careful watering for a while after construction.